Butterfly Baby Place: Fall is going to be so fun! Making new things really gets me all excited, which makes me laugh, in and of itself. I experimented with a new venture today: PANTS! You know what? They're fun to make. Yes that's right, this 26-year-old has fun sewing! 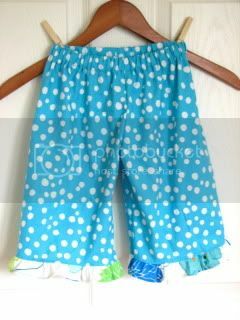 I received a custom request to make a pair of capris to match one of the dresses in my shop and I'm loving the outcome. Now I can only hope the recipient of these will love them just as much!